This article is a step by step breakdown on how to enable calendar day booking. By enabling, the system will calculate an extra day when calculating the differences between pickup and return. By default, the system does not enable the setting. To learn more about the calendar, click here. Next, navigate to “Rates & Day Calculations” and select “Yes” under “Enable Calendar Day Bookings?” highlighted in orange in the picture below. 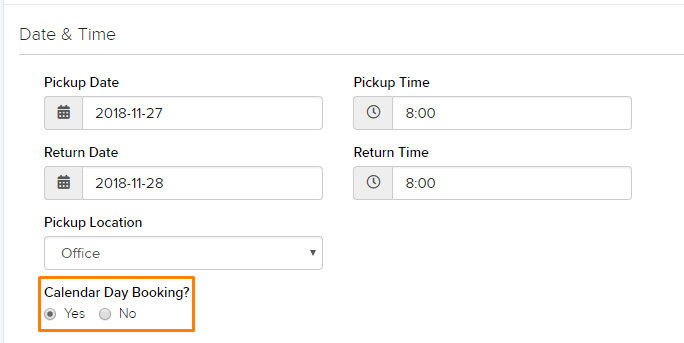 You can also click set whether or not calendar day is the default booking by selecting “Yes” under “Set Calendar Day Bookings by Default” as shown in the picture below. Now when you create a reservation, you can select whether it would be a calendar day booking or not, as shown in the picture below. The picture above shows the pricing and the number of days with calendar day booking turned off. The picture below shows the pricing and the number of days with calendar day booking turned on.